Bernadene Blaha’s “brilliant command of the piano”, whether featured as recitalist, concerto soloist or chamber musician, has been heralded in performances throughout North America, Europe, Australia, Asia and Mexico. 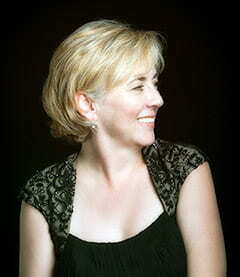 Piano and Keyboard magazine has reviewed her as, “a pianist of integrity, with lovely sonorities and total clarity of line.” Highlights of this season include return engagements at the Newport Music Festival, Los Angeles Philharmonic Chamber Music Series, Worcester Chamber Music Society as well as performances in Canada, France and Italy. An avid chamber musician, Ms. Blaha’s earliest coaches included Menahem Pressler, Felix Galimir, Lorand Fenyves, Aldo Parisot, and Janos Starker. She has been a regular guest at international music festivals and has been privileged to perform with renowned cellists including: Laurence Lesser, Ronald Leonard, Nathaniel Rosen, Eleonore Schoenfeld, Sergey Antonov, Steven Isserlis, Lynn Harrell, Desmond Hoebig, Daniel Rothmuller, Andrew Shulman, Amit Peled and Shauna Rolston. Ms. Blaha is a founding member of the piano trio Latitude 41, formed in 2009 with violinist Livia Sohn and cellist Luigi Piovano. Their debut CD of Schubert’s monumental “Trio in E-flat Major” and “Notturno” was released in 2011 on the Eloquentia label to rave reviews. The group followed this success with a recording of the Saint-Saëns Trios and has a forthcoming CD featuring the Brahms Piano Trios. Ms. Blaha’s discography also includes recordings for the CBC, Centaur and Analekta labels.